Over the years we have gathered insights that have proven that the wallet size in many African households is perpetually constrained. African consumers are more compelled to purchase only what’s important to them. This has brought about the need for businesses to invest in customer analytics to have a deeper understanding of who their customers truly are. Consumers today are more empowered with alternatives and information on competing brands. This is making it increasingly important for organisations to pick out key insights that can help them establish their consumers behaviour and predict how consumers will interact with their brand to enable them to strategise accordingly. Customer segmentation is essential. It is no longer an option to know your consumers lifestyle preferences and spending habits. Businesses also need to establish the satisfaction and loyalty levels of their customers and demographic information in order to transform their products and services according to customer needs. The challenge for businesses often arises when seeking access to this crucial information. Often times, even with an existing customer database, there is a problem of getting quality insights. Customer information tends to get mixed up as a result of originating from several sources including internal company systems and third party services making them vary in consistency, quality and more. mSurvey has solved this challenge by building its customer analytics module which gives a business access to a single, consolidated view of a customer. 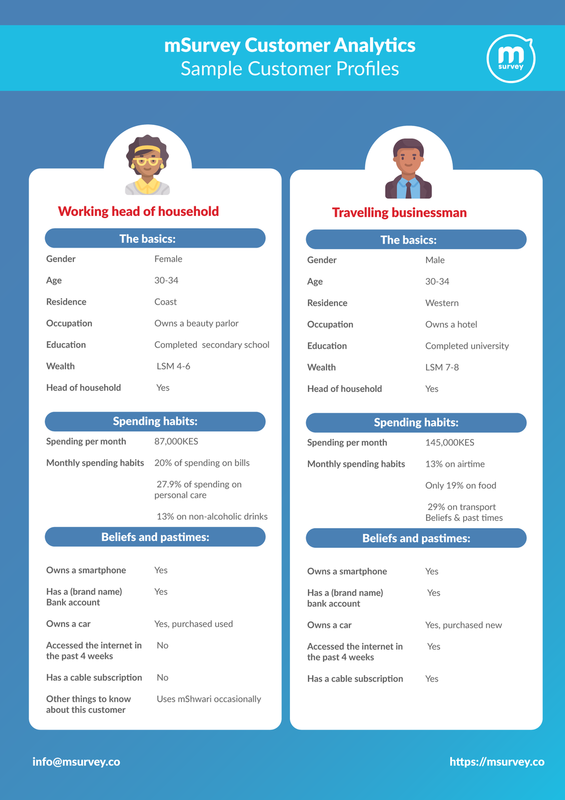 Each individual customer has a unique profile with basic information as well as preferential details such as customer loyalty, spending behaviour and other habits. Extensive use of customer analytics over time can help your business drive growth. These insights increase customer loyalty and help you reduce churn by developing proactive strategies to enhance customer retention. All this would ultimately lead to increased revenue. More effective customer segmentation would also enable a business to create better messaging that appeals to their target audiences. Such businesses can expect to reduce on their marketing costs by enabling them to target customers who are more likely to purchase their products or services. Speak to us today to learn more about mSurvey’s customer analytics.